"A dense pound cake with three flavors--vanilla, orange and almond." In a large bowl, cream together the butter and sugar until light and fluffy. It should be noticeably lighter in color. Add eggs one at a time, beating well after each addition. Stir in vanilla, orange and almond extracts. Blend in the flour mixture, alternating with the sour cream, until fully incorporated. Pour batter into prepared pan. Bake in the preheated oven until a toothpick inserted into the center of the cake comes out clean, about 70 minutes. Allow cake to cool on rack before removing from pan to cool completely. 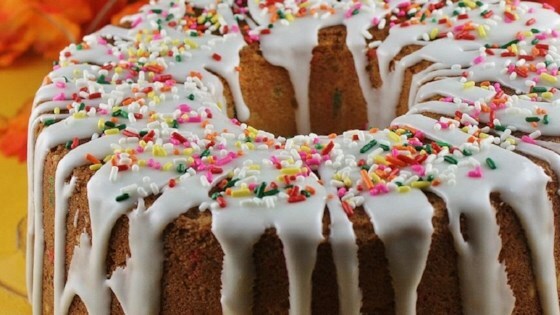 this cake needs more flavor - the "crust" is delicious, but the middle is tasteless. i know that doesn't make sense, but everyone in my family said the same thing. Wonderful cake. Lots of flavor. My kids and my husband loved it. I did too!! Very nice, dense cake. Will definately make this again. It gets the workmates seal of approval!! This is the best pound cake I’ve ever had. Made it Christmas day and it was a huge hit with the family. The orange extract gives it an added boost. I’ll be making this again in the future. This is, hands down, the best pound cake I've ever had.....I'll be making this a lot in the future! Good cake. Much too sweet though, I would recommend using a little less sugar. The flavor is pretty casual, so serve the cake with something else, like ice cream or strawberries. This is a very good cake. Goes well with coffee or tea.